The Charles Street Reconstruction Project includes new travel/parking pavement, sidewalk repavement, new curbs, signage, replanting of trees, new crosswalks, bike lanes, etc. on Charles Street between 25th Street and University Parkway. An artist has been commissioned to engage the plaza being created on the east side of Charles between 33rd & 34th Streets with an artwork that is integrated into the landscape site work. A Request for Qualifications was released in November of 2009. A total of 90+ applications were received and reviewed by the Public Art Commission. Finalists presented design proposals and artist team Laura Haddad & Tom Drugan were commissioned for the project. Optical Gardens, an integrated art proposal for Baltimore’s Charles Street, is conceived as a platform that gives expression to unique natural and cultural characteristics of Charles Village, including its culture, community, built environment, natural environment, climate, and seasons. The installation will consist of a sequence of four outdoor rooms, or “stages,” each illustrating a season. The rooms are strung together along two overlapping axes that move through each space, one hydrological and one optical. The hydrological axis is a watercourse fed by storm water runoff. The optical axis looks at water at telescopic and microscopic scales. 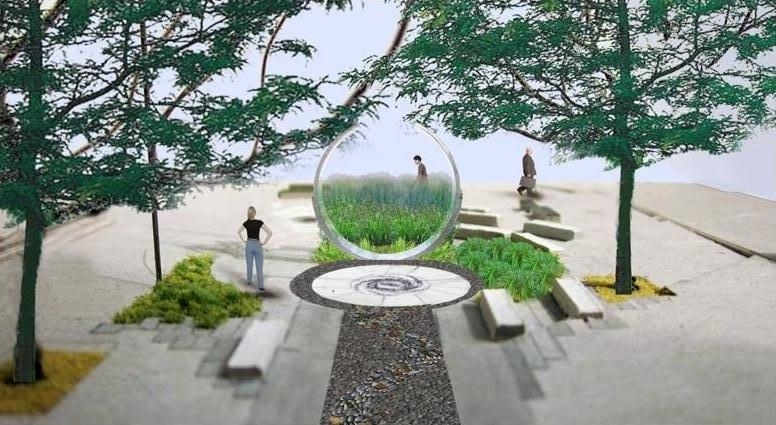 The goal of Optical Gardens is to create environmental art that dramatizes the performance of nature by showcasing seasonal shifts and sustainable practices of storm water management, and the performance of community through a series of stages for the everyday performance of urban life. At night, a play of saturated colored light transforms the landscape into a theatrical version of its daytime self by highlighting and enhancing elements and processes featured in the installation. Feeding into its agenda of sustainability, the materials of Optical Gardens include recycled stone, storm water, durable stainless steel, high-efficiency LEDs, and native plants. The carved granite elements located in each “room” are being fabricated locally by Sebastian Martorana, a Baltimore based artist. Currently, Tom Drugan & Laura Haddad are in the fabrication phase of the project and it is expected to be installed in the Fall of 2013/Spring of 2014. Designs and construction documents have been finalized and sealed by a licensed engineer in the State of Maryland.